It's actually fairly common to use unnamed sources, and fairly common for people to confirm or deny what they say. (In fact, it's also common to use quotation marks for actual quotes.) Here in NYC, it's pretty hard for us to accept at face value what we hear from leadership. For one thing, there's no disputing that our union is run by an elite, invitation-only group called the Unity Caucus that operates in secret and demands a loyalty oath for entrance. There are, of course, perks to the loyalty oath. At the lowest rung of the ladder, you get to go to conventions and vote however Mulgrew instructs you. As you move up, you go from after-school gigs at UFT HQ all the way to the Holy Grail--a full-time gig that gets you out of the classroom altogether. So there are those of us who question the motivation of many of those who ostensibly represent us. Some of us were particularly curious when Michael Mulgrew announced that we were going to fight on funding but not evaluation. I make no apology for trying to find out why the hell leadership declines to confront Cuomo's insane ideas, nor for sharing what I hear with readers of this blog. This is exactly what UFT invariably says to those of us who oppose their secretive machine, and the degradation of our profession over which it's presided, contract after contract. We all have to stick together, they repeat, and anyone who disagrees needs to sit down and shut up. Those of us who believe in transparency and democracy find that unacceptable. It's always time to oppose Bloomberg, or Cuomo, or whoever we've failed to oppose in the election. It's always time to stand as one. Except, for example, when leadership makes Bill Gates keynote at a convention. Or when Messner participates in a coup to topple sitting NYSUT leaders. That's OK, somehow. Should there be yet another coup, in which, say, Messner takes the presidency from Karen Magee, I'm sure that would be fine too. 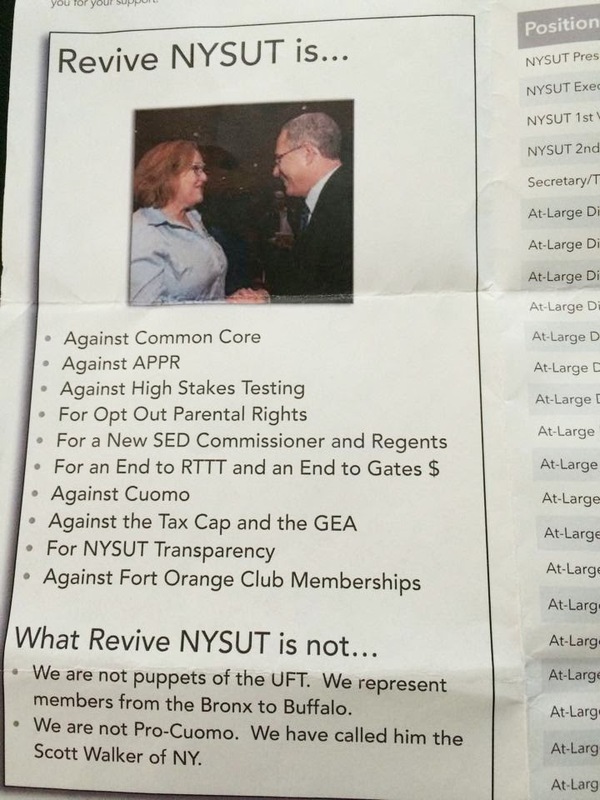 And make no mistake, Revive NYSUT, despite its explicit pledge in the campaign literature above, failed to oppose Andrew Cuomo in the last election. Brilliant and inspirational Zephyr Teachout sought the WFP nomination, and could have posed a strong threat to Andrew Cuomo. NYSUT did not support her. Had it chosen to do so, Cuomo would have faced a real problem. NYSUT also failed to endorse Teachout in the Democratic primary. These are odd actions for people who claim to oppose Cuomo. I oppose Cuomo, and I supported Teachout. I contributed to her campaign several times, and met her at a Suffolk rally. Maybe, just maybe, the time to oppose demagogues is when they run for office. We all knew what we were getting with Cuomo. Maybe what we need is leadership that will take decisive action when the time is right. Revive NYSUT's tactic of sitting on its hands during elections and hoping for the best is clearly not working out all that well. Nor is its tactic of failing to keep its explicit campaign promises.